Recent studies have shown that 90% of Americans use digital devices for two or more hours each day and the average American spends more time a day on high-tech devices than they do sleeping: 8 hours and 21 minutes to be exact. If you’ve ever considered attempting a “digital detox”, there are some health benefits to making that change and a few tips to make things a little easier on yourself. Many Americans are on their phones rather than playing with their children or spending quality family time together. Some people give up technology, or certain aspects of it, such as social media for varying reasons, and there are some shockingly terrific health benefits that come along with that type of a detox from technology. In fact, more and more health experts and medical professionals are suggesting a periodic digital detox; an extended period without those technology gadgets. Studies continue to show that a digital detox, has proven to be beneficial for relationships, productivity, physical health, and mental health. If you find yourself overly stressed or unproductive or generally disengaged from those closest to you, it might be time to unplug. It may go unnoticed but there are many who are actually addicted to their smartphones or tablet. It could be social media or YouTube videos, but these are the people who never step away. They are the ones with their face in their phone while out to dinner with their family. They can’t have a quiet dinner without their phone on the table. We’ve seen them at the grocery store aimlessly pushing around a cart while ignoring their children and scrolling on their phone. A whopping 83% of American teenagers claim to play video games while other people are in the same room and 92% of teens report to going online daily. 24% of those users access the internet via laptops, tablets, and mobile devices. Addiction therapists who treat gadget-obsessed people say their patients aren’t that different from other kinds of addicts. Whereas alcohol, tobacco, and drugs involve a substance that a user’s body gets addicted to, in behavioral addiction, it’s the mind’s craving to turn to the smartphone or the Internet. Taking a break teaches us that we can live without constant stimulation, and lessens our dependence on electronics. Trust us: that Facebook message with a funny meme attached or juicy tidbit of gossip can wait. Another benefit to keeping all your electronics off is that it will allow you to establish good mannerisms and people skills and build your relationships to a strong level of connection. If you have ever sat across someone at the dinner table who made more phone contact than eye contact, you know it feels to take a backseat to a screen. Cell phones and other gadgets force people to look down and away from their surroundings, giving them a closed off and inaccessible (and often rude) demeanor. A digital detox has the potential of forcing you out of that unhealthy comfort zone. It could be a start toward rebuilding a struggling relationship too. In a Forbes study, 3 out of 5 people claimed that they spend more time on their digital devices than they do with their partners. This can pose a real threat to building and maintaining real-life relationships. The next time you find yourself going out on a dinner date, try leaving your cell phone and other devices at home and actually have a conversation. Your significant other will thank you. The sleep interference caused by these high-tech gadgets is another mental health concern. The stimulation caused by artificial light can make you feel more awake than you really are, which can potentially interfere with your sleep quality. It is recommended that you give yourself at least two hours of technology-free time before bedtime. The “blue light” has been shown to interfere with sleeping patterns by inhibiting melatonin (the hormone which controls our sleep/wake cycle known as circadian rhythm) production. Try shutting off your phone after dinner and leaving it in a room other than your bedroom. Another great tip is to buy one of those old-school alarm clocks so the smartphone isn’t ever in your bedroom. This will help your body readjust to a normal and healthy sleep schedule. Your eating habits can also suffer if you spend too much time checking your newsfeed. The Rochester Institute of Technology released a study that revealed students are more likely to eat while staring into digital media than they are to eat at a dinner table. This means that eating has now become a multi-tasking activity, rather than a social and loving experience in which healthy foods meant to sustain the body are consumed. This can prevent students from eating consciously, which promotes unhealthy eating habits such as overeating and easy choices, such as a bag of chips as opposed to washing and peeling some carrots. Whether you’re an overworked college student checking your Facebook, or a single bachelor watching reruns of The Office, a digital detox is a great way to promote healthy and conscious eating. Social media addicts experience a wide array of emotions when looking at the photos of Instagram models and the exercise regimes of others who live in exotic locations. These emotions can be mentally draining and psychologically unhealthy and lead to depression. Smartphone use has been linked to loneliness, shyness, and less engagement at work. In other words, one may have many “social media friends” while being lonely and unsatisfied because those friends are only accessible through their screen. Start by limiting your time on social media. Log out of all social media accounts. That way, you’ve actually got to log back in if you want to see what that Parisian Instagram vegan model is up to. 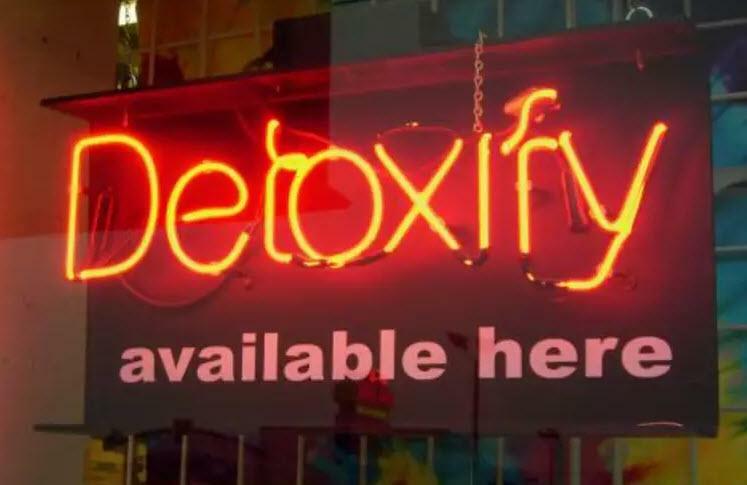 If you feel like a detox is in order but don’t know how to go about it, start off small. Try shutting off your phone after dinner and don’t turn it back on until after breakfast. Keep your phone in another room besides your bedroom overnight. If you use your phone as an alarm clock, buy a cheap alarm clock to use instead to lessen your dependence on your phone. Boredom is often the biggest factor in the beginning stages of a detox, but try playing an undistracted board game with your children, leaving your phone at home during a nice dinner out, or playing with a pet. All of these things are not only good for you but good for your family and beloved furry critter as well!